This comprehensive CEN exam preparation course offers the latest information and trends in emergency room nursing. An in-depth review of systems and refresher on current practices will prepare you for success by not just reviewing key points, but also reinforcing them through realistic test questions! 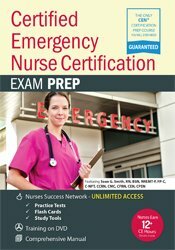 The CEN exam prep covers all clinical and professional issues per the current exam blueprint, plus you’ll gain valuable test-taking strategies and tips that are certain to aid in your quest for success on the Certified Emergency Nurse exam! Join expert speaker and certification coach, Sean G. Smith, RN, BSN, NREMT-P, FP-C, C-NPT, CCRN, CMC, CFRN, CEN, CPEN, for this dynamic session that will increase not only your emergency nursing knowledge, but also your earning power and employment opportunities. Multi-disc audio recording (12 hours, 20 minutes) with electronic manual and instructions. Identify pearls and pitfalls in both preparing for and taking Certified Emergency Nurse (CEN®) exam. Develop a study plan for the exam based on understanding the blueprint and domains of practice covered (didactic/clinical knowledge base concerns). Analyze key components of a comprehensive review of systems, including diagnosis and treatment of medical and traumatic pathologies per the official exam blueprint. Apply how the core curriculum components of medical and traumatic pathologies are covered in the exam through didactic supplementation and test questions. Develop a thorough understanding of professional issues facing the emergency nurse, such as ethical dilemmas, withholding, withdrawing, and palliative care, forensic evidence collection, federal regulations (e.g., HIPAA, EMTALA), triage, and disaster management. Apply how the core curriculum components of emergency nursing professional issues are covered in the exam through didactic supplementation and test questions. Apply the knowledge gained throughout the day in a comprehensive mini-exam, using realistic questions that simulate typical exam items. State three rapid interventions that can stabilize a patient who is symptomatic with a low blood pressure. Identify the three most common dysrhythmias using rhythm strip interpretation. Discuss the three biggest concerns patients recognize at the end of life. Differentiate the differences between a STEMI and NSTEMI. Nurses completing these self-study materials will earn 12.5 contact hours. Expires: 6/13/2019. Iowa Nurses: PESI, Inc. is an approved provider by the Iowa Board of Nursing. Provider #: 346. Nurses successfully completing these self-study materials will earn 15.0 self-study contact hours.